It is always good to witness organic food being the center stage at a restaurant of a five star hotel. I know a few standalone restaurants across the country who are doing good business serving organic food or even millets as their core strength. It is very encouraging that such naturally grown seasonal foods are being recognized as a potential business idea too. It means there are people like me and you who are appreciating real food a little more than before. Although I believe organic food is just a small way we can save the environment, the way we consumers demand the kind of food is also very important so there is a harmony between what is being grown and what is being consumed. 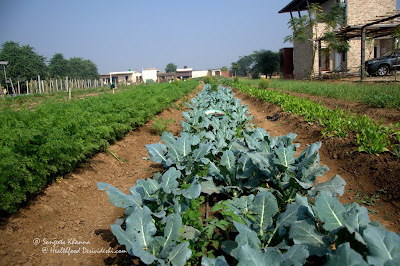 The organic farmers need to grow what grows best in their region without depending on too many natural resources and we as consumers must be aware of the local produce and their respective seasons and limitations in farming too. If we demand lettuce all year round it may force the farmers to depend on green houses, more consumption of electricity and fuel in order to water the lettuce and protect it from extreme heat. By the way Lettuce and other exotic salad greens are consumed mostly in the bigger cities and it is quite a task to bring it in special packaging because once it wilts it is useless. So much natural resources spent on growing the salad greens that need more fuel and electricity to maintain the freshness till it reaches the consumer and then if it wilts at the last step or in our own refrigerator it means a huge wastage of all the expenditure done to grow it. And the expenditure is not just in terms of money but the cost of a larger carbon footprint. Why not be aware of the season and consume the salad greens when they are in season? That is why I was quite pleased to see some fresh spinach leaves and the arugula that grow comparatively easily in this climate, on my plate at Fire, the iconic restaurant at The Park here in Delhi. Everything locally grown and sourced from organic farmers, the Burrata in this salad comes from Father Michael of Bangalore and the micro greens are grown in-house, at the terrace of the hotel indeed. Well, the Burrata could have also been sourced locally but I see it as a positive beginning of the idea of locally grown organic food. Chef Abhishek Basu told me they have made a list of organic farmers and suppliers who are part of their regular supply chain now and they are receiving great response for the guests for this menu, which they have aptly named as The Earth menu. You will find really nice Prawns tossed in Bhoot jolokia sauce, plump tiger prawns from coastal Gujarat and the hot chillies form Assam, coming together to represent a truly Indian menu. There are a few things that are difficult to source organically grown and this menu doesn't claim to be 100% organic, the intention is to let the guests know about where the food comes from. I quite liked the mutton sukka that was made using free range goat meat. You can taste the difference between farmed and free range meat indeed. I had requested podi smeared idli and that was my favourite that day. The spicy pandi curry and a broccoli tikki etc are some of the things you might like to try, the tasting menu comes in multiple courses served in small portions so you can have the idea of the rich variety it packs in. It is in fact pleasant to see a menu that doesn't depend upon the coloured bell peppers, green and yellow zucchini and loads of lettuce for garnish. A crisp fried curry leaf can be a great garnish that lends taste too, something that is available throughout the year and can be used for a menu that has to maintain consistency. I wish great luck to Chef Basu and his team, it is a great effort and and I see it will restore our faith in real food being sustainable even for the luxury hotels. I am so glad local and seasonal, organically grown food is not just a trend that fizzles out on its own. It is here to stay and I already see a lot of hotels and restaurants finding their own ways of serving either a farm to table experience or going for organic produce mostly. PS: the food pictures are provided by The Park. I went to taste the menu at a time when I couldn't even handle the camera after the chikunguniya induced joint stiffness.